There is a wealth of books about Malta, dealing with almost every aspect of life on the islands. Considering the number of tourists Malta receives it is somewhat surprising that the islands hardly features in travel literature. There is a wealth of books about Malta, dealing with almost every aspect of life on the islands. Considering the number of tourists Malta receives it is somewhat surprising that the islands hardly features in travel literature. One delicious exception is Uncommon Malta, a book edited by Maltese journalist Emma Mattei which can best be described as a field manual for the contemporary explorer, inviting readers to engage with the islands in an innovative and intimate way and to explore the roads less travelled. A number of international authors who have visited or relocated to the islands have subsequently written about them or used them as a backdrop for their stories. The classic English language novel about Malta remains Nicholas Monsarrat’s The Kappillan of Malta – a very enjoyable holiday read. Written in the early 70’s when Monsarrat was living in the Gozitan village of San Lawrenz, it tells the tale of a humble priest and his experiences in wartime Malta, seamlessly interlaced with episodes from Malta’s history from the dawn of time. Nicholas Rinaldi’s novel The Jukebox Queen of Malta, first published in 1999, also uses WWII Malta as a backdrop – a love story between an American soldier and a Maltese girl. The book has been compared to Captain Corelli’s Mandolin with its juxtaposition of island romance, local history and the senseless violence of war. Sword and Scimitar by bestselling author Simon Scarrow, published in 2012, is powerful masterpiece that hurls you right into the location and time in history. Scarrow takes the Great Siege setting with true life characters (some fictional) and adds, intriguing elements such as the pursuit for the scroll that could threaten the reign of England’s Queen Elizabeth. The British novelist Anthony Burgess also resided in Malta for a brief time in the late 1960’s. He lived in a house in Lija, which serves as the fictional home of the 81-year-old protagonist in his masterly novel Earthly Powers. Burgess’s mention of Malta in the novel is however brief and none too complimentary either. Away from fiction, Jeremy Boissevain’s Saints and Fireworks is a highly interesting anthropological study of religion and politics in rural Malta and an entertaining insight into the intricate fabric of traditional Maltese society. This highly readable sociological study is easily comparable to Guareschi’s Little World of Don Camillo … except that it’s not fiction. Malta’s history and architecture are the subject of numerous books. The British historian and author Ernle Bradford spent some 30 years sailing the Mediterranean and lived in Kalkara for a number of years. His Mediterranean writings include three highly readable books directly related to Malta: The Great Siege: Malta 1565; The Shield and the Sword: The Knights of St. John, and Siege: Malta 1940-1943. Brian Blouet’s The Story of Malta is another evergreen in this genre. First published in 1967, the book has been through several editions since – the latest in 2007. Liverpool born professor and architect Quentin Hughes moved to Malta in 1968 to start the faculty of Architecture at the University of Malta, becoming its first Professor of Architecture in 1970. He has written two books on the islands’ rich architectural heritage: The Building of Malta 1530-1795 (1956) and Fortress: Architecture and Military History in Malta (1969). Both books have gone through several reprints. Among the Malta archaeological guides on offer it is perhaps David H.Trump’s offering which top the list. Trump was for a time (1958-1963) curator of the National Museum of Archaeology in Valletta and developed a program of archaeological digs including the first excavations at the site of Skorba . 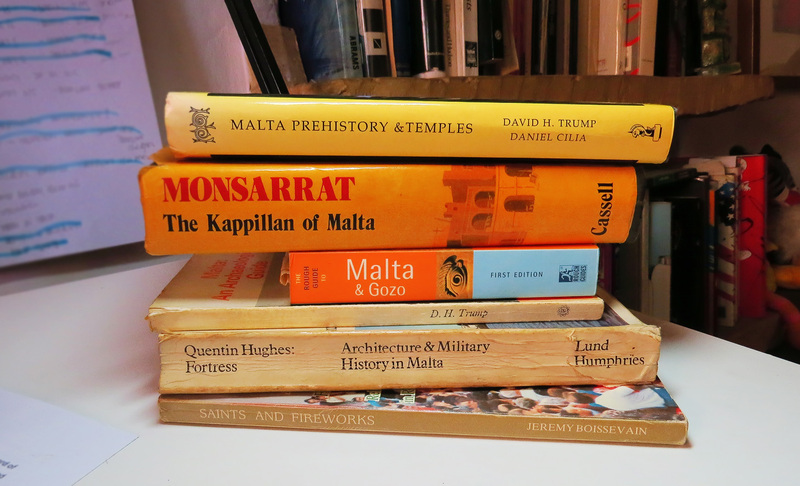 His books Malta: An Archaeological Guide and Malta: Prehistory and Temples are worth seeking out, and Trump’s genuine love of the islands comes out clearly in his writing. Malta also has a good crop of valid contemporary writers. Francis Ebejer (1925-1993) is one of the few whose output is almost exclusively in English. Ebejer was the leading Maltese dramatist of the second half of the 20th century. In his ground-breaking plays he introduced a deep introspection of Maltese society, using an elegant style that proved him to be a master of the language. Other contemporary authors are writing mostly in their native Maltese language but there are English translations of diverse works by Joe Friggieri (b 1946) Oliver Friggieri (b 1947), Immanuel Mifsud (b 1967), Clare Azzopardi (b 1977) and Pierre J.Mejlak (b 1982).